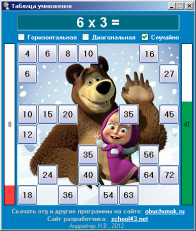 The table of division on 3 is the 2nd stage in which the child is offered to choose from numbers 1, 2, 3, 4, 5, 6, 7, 8, 9 answers to nine examples listed below. The fact of successful passing of division on 3 is noted in the form of a green small square with figure 3 on the gray panel. 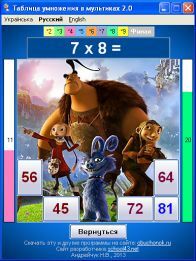 Versions of answers are displayed on square buttons, examples are brought in a random way to panels of questions. If in this round one mistake is made at least, the program will issue the corresponding message and (Return button) for repeated passing 2 stages will suggest to return. If mistakes it isn't allowed, the casual picture will open completely and the corresponding fragment of a melody from this animated film will sound. 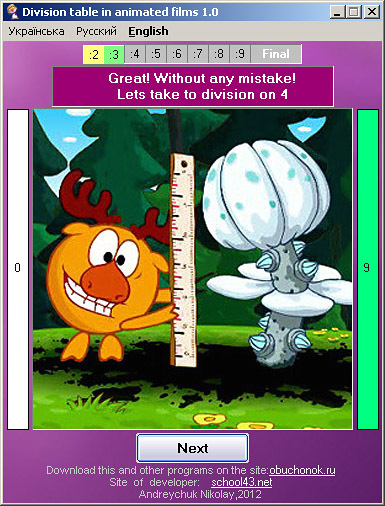 After opening of the picture, listening of a melody and pressing of the Pass button there will be a transition to the following grade level - "Division on 4".